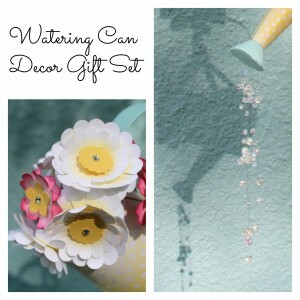 Just Julie B's Stampin' Space: Watering Can Decor Gift Set! This bright and cheerful watering can is a beautiful décor piece that is guaranteed to add some sunshine into any space. The watering can hangs at a downward angle showering crystal water droplets downward that catch and reflect the sunlight. The watering can also features a bright and beautiful bouquet of flowers. Pair it up with the matching card and this is the perfect gift to give to brighten someone’s day! This super pretty project was made by Amanda Corbet. To get the instructions for Amanda’s project, just subscribe to July (or one of our 3, 6 or 12 month discounted packages! ), and meet one of the bonus project requirements of subscribing to two or more months in a row, putting the Craft Project Central badge on your blog, or referring a friend and when they subscribe, letting us know! !